We are a small company and can't afford to do large scale donating, but we do what we can. Here are a few of the interesting projects we've been involved with. We do offer a 15% discount for all schools and non-profit organizations. Just call us to order. Pudget Sound 56' Viking Ship - Ongoing. 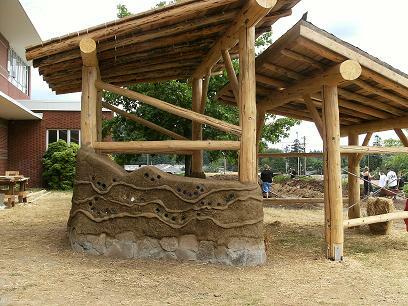 A great project from Wild Expeditions, an outdoor youth education program. Here's a cool video about it on YouTube. October 2010- Colorado- Geometric & hand tool workshop frame. John C. Campbell Folk School Blacksmith Shop, Brasstown, NC. We don't get out of the shop much, but we did for this great project. Not only did this one get lots of Land Ark wood finish but our two week vacation time too to help build it. It was a historic project which you will hear more about, I'm sure! Other links of interest & project coverage: Folk School BLOG with lots of great coverage. The marketing director of the folk school's slide show The Timber Framer's Guild links. Silver Park Project, Sept. 2008. Missoula, Montana. More info on TFG website here. Complete. 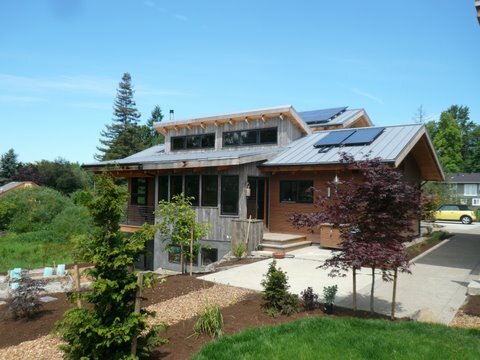 The Vermont Street Project- LEED Platinum home by New Energy Works Timber Frames, Portland, Oregon. Now Complete!